Between changing work styles and research on health and ergonomics, it’s clear that today’s knowledge workers need different office lighting than in the past. 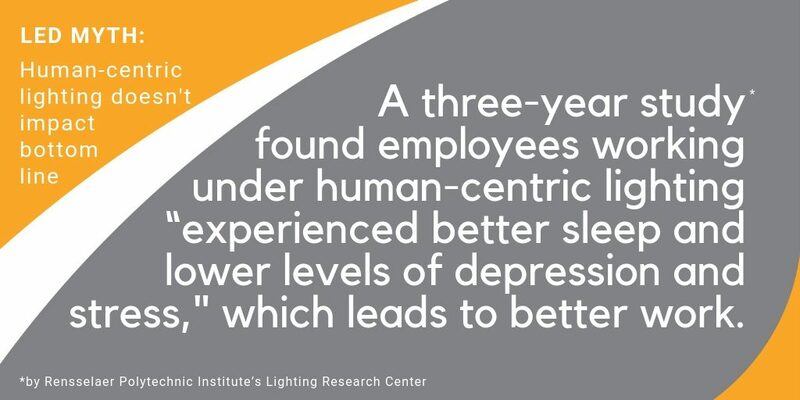 Lighting has a huge impact on how we work, our productivity levels and how happy we feel at work. Given the low national employment rates and labor shortages many industries are facing, many companies are investing in their facilities as a way to recruit and retain staff. Add to that WELL building standards, corporate and government energy efficiency initiatives and new office space flexibility needs. Designers have a lot of constituencies to satisfy when creating the light for a facility. The fight for the best talent is getting fierce and the recruiting competition is driving companies to rethink their physical spaces. More and more, successful companies are elevating their workplaces from bland offices into experiences. Lighting is a key ingredient. Current controls make LEDs more flexible and versatile than any other light source. Without changing anything other than the lights in a space, you can have a focused workspace in the morning, a café for team lunches and a pump-up meeting in the afternoon. 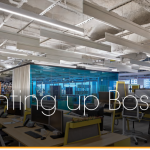 Lighting controls make it easy to deliver an enjoyable working experience and even make employees healthier. Watch an office scene in an old movie and you’ll notice people working at desks barren of electronics and using pen and paper. Today of course, most workers use computers (and may have several monitors too!) and therefore look down at their desks less often. Until recently, calculations for fixtures, distributions and lighting levels were based on horizontal surfaces, like desks. The shift towards vertical surfaces like computer screens and people’s faces is changing how light needs to be distributed. Vertical lighting is growing in importance. Instead of large overhead downlights, lighting for vertical surfaces often involves lower ambient lighting with brighter task lighting people can adjust. The best light for human health is unsurprisingly, natural light. Many building designs leverage lots of glass to let in natural sunlight. This creates a warm, welcoming and productive space. When traditional windows aren’t viable, light tubes can pull daylight into interior and underground spaces by employing reflectors. Of course, daylight alone often isn’t enough and light tubes aren’t the answer to everything. Enter daylight harvesting, also called daylighting. With daylighting, the artificial lights dim or rise to complement the natural light and maintain consistent light levels during the day. 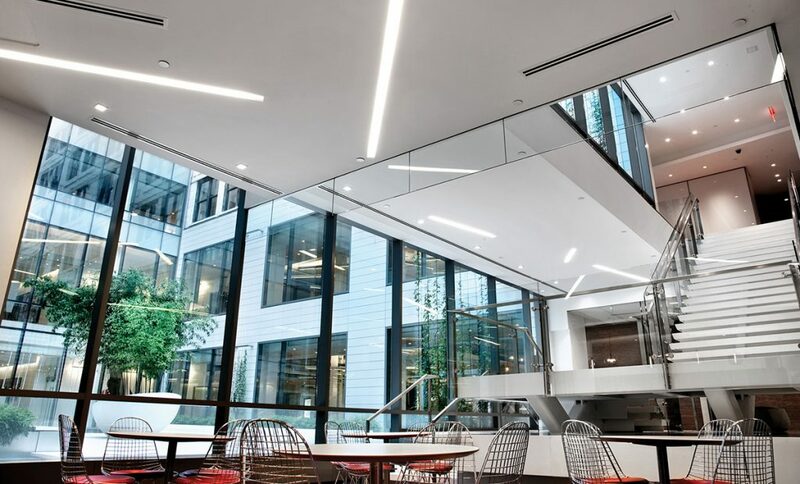 Made possible by modern LED controls, daylighting reduces energy costs, while also enhancing the health of employees working in the space. It’s a gospel truth in the lighting industry that LEDs are ultra-efficient and can have a dramatic impact on energy costs. When LEDs came out, many luminaire manufacturers touted their LEDs’ energy efficiency while shortchanging the quality of the light. However, it’s more than possible to have excellent light while also maximizing energy efficiency. 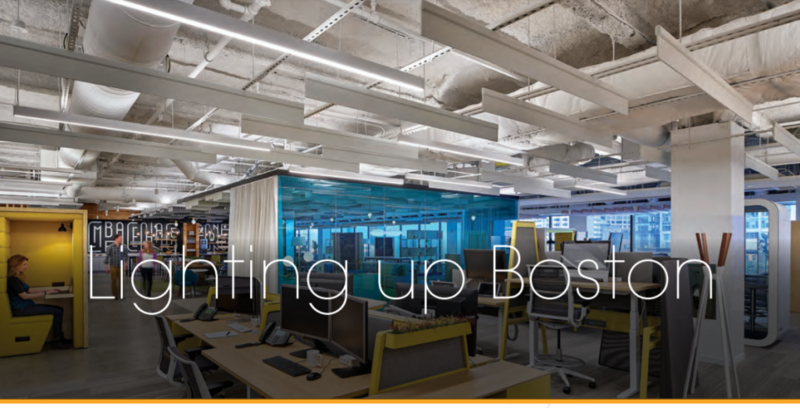 Here’s an example: A financial firm in Boston upgraded their lighting in an open collaborative space. Using an indirect linear pendant solution, Keith Yancey, a principle of lighting design firm Lam Partners, was able to secure a $7,200 incentive from the local utility company. “We got a utility incentive for our client with the lighting because we were able to meet the light requirements with fewer watts per square foot,” said Yancey. “We ended up with only 0.59 watts per square foot. 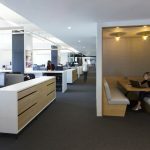 It’s easier to get the power density down with the open space and the Amerlux fixtures deliver efficient, even illumination without a lot of watts.” (Read the full case study here). Lighting has a huge impact on how we do our jobs—from the base level of ensuring we can see what we’re doing to boosting mood and cognitive function. In general, cooler-toned lighting (between 5,000K and 7,000K) is effective at enhancing employee productivity. This is also the color temperature range for daylight, so matching the interior lighting to the sun is extra beneficial. Cooler light has a lot of blue in it, which boosts alertness, uplifts our moods and lower sleep hormone levels. This kind of light is ideal for brainstorming rooms or any space where workers should feel invigorated and galvanized to share ideas. Lighting is a powerful tool for creating spaces that are beautiful, efficient, healthy and productive. Amerlux has been developing innovative lighting solutions to power commercial buildings for decades. Their lights illuminate cities and offices all over the world. Learn more here. Consult with a lighting specialist today!